If you’ve ever been disappointed with the audio when recording your own music, GO:MIXER PRO delivers an ultra-clean stereo signal without the background noise that can ruin a performance. If you play music with others, you can simultaneously capture three different instruments through dedicated inputs, for example keyboards, guitar/bass and vocals, and adjust their volume levels—perfect for recording demos or rehearsals. If you’re a vocalist, GO:MIXER PRO makes it easy to create performance videos while singing along with your favorite songs on the smartphone. The Center Cancel function reduces the volume of the main vocal in any song you play back*—making room for your own vocal to take center stage. You can even connect a pro-grade electret condenser microphone** for studio-quality vocal recordings. *Results are dependent on how the song is mixed. Thanks to smartphones and social media, livestreaming has become incredibly popular—and easy to get into. But if your broadcast involves musical instruments, or you simply need high-quality sound, then you quickly run into the limitations of your smartphone’s built-in microphone. GO:MIXER PRO has multiple inputs for a well-balanced, great sounding mix, and its battery operation takes the strain from your smartphone, so you can livestream for longer. Depending on conditions, GO:MIXER PRO can run for over four hours on just four AAA batteries. Roland’s 4XCAMERA app combines up to four separate performances into a single split-screen video—perfect for showcasing your multi-instrumental jamming skills. Available for iOS and Android, the free version of 4XCAMERA can capture and combine two performances, for a two-screen video. GO:MIXER PRO owners can use the upgraded version of 4XCAMERA, letting you shoot performance videos made up of four screens (2x2), with each screen containing a separate vocal or instrument take. Roland’s Virtual Stage Camera is a free iOS app that lets you replace the background of your video—with any movie footage or stills from your smartphone in real-time while shooting—maybe you’ll jam with your favorite band or be the first person to play a gig in space. The Virtual Stage Camera app enables you to produce a blue or green background video easily in real-time, which lets you replace the original background with a new, more exciting one. Once the blue/green screen video is produced, transfer the file to any editing software with superimposing capability, such as Apple iMovie, and take your production to the next level. GO:MIXER PRO works as a mobile audio mixer for small gigs or parties, thanks to its multiple inputs, battery operation, and compact size. The only other things needed for a go-anywhere party rig are a portable amp and some instruments. Then add some people and start jamming with keyboards, bass/guitar, and vocals…or just sing along with your favorite songs from your smartphone. If you compose or produce original songs using a smartphone or tablet, GO:MIXER PRO is an ideal partner. When used with music production apps like Apple Garage Band, you can record your vocal parts while listening to the backing track on your device. If you switch the Loopback function off, only your vocal part will be recorded, with the backing audio on your device acting as your guide track. Features • Palm-sized audio mixer for smartphones. • Multiple inputs—connect a mic, pin-mic, musical instruments, and media players. • Stereo 1/8-inch Mic In mini-phone jack with plug-in power (2.5 V) for connecting pin-mic. • Combo type Mic input supports XLR and 1/4-inch plug equipped with phantom power (48 V). • Powered by the smartphone connection or battery-powered operation, Alkaline battery (AAA, LR03) x 4, for use without draining smartphone power. • Center Cancel function for reducing the volume of pre-recorded vocals (results vary depending on the original recording). • Loop back function controls whether the smartphone’s backing track is recorded back into the smartphone along with your voice. • Use as an audio interface with DAW apps for smartphones or tablets. 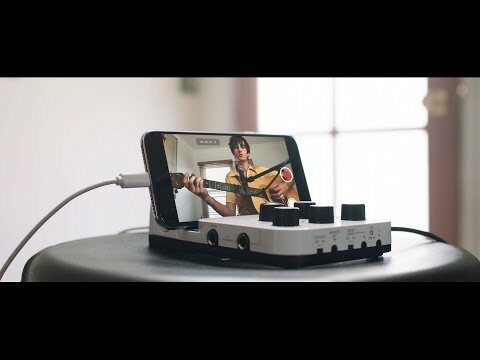 • Produce unique split-screen music videos with Roland’s 4XCAMERA app for iOS and Android. • Change the background in your videos using Roland’s Virtual Stage Camera app for iOS.